Only two people have had their licenses suspended since a high-profile law aimed at slowing pedestrian-traffic deaths went into effect. This article was originally published June 10 in the West Side Spirit. 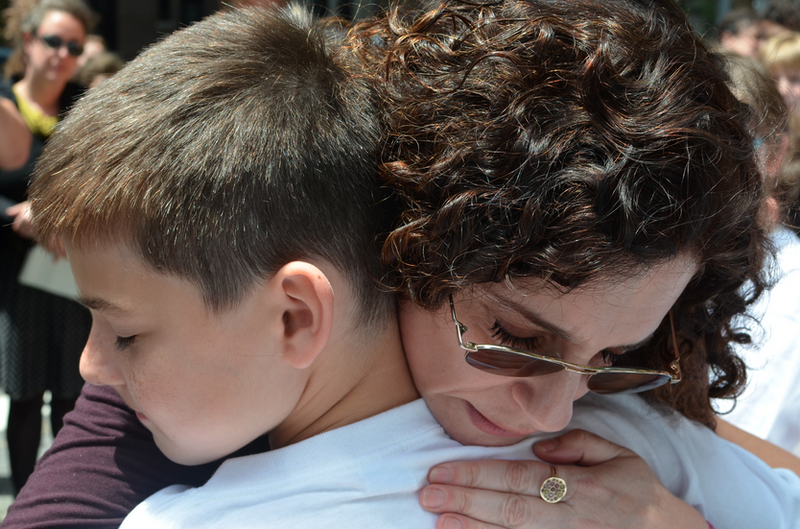 Dana Lerner embraces Jonathan Hume, who along with his twin brother Jacob, eulogized their former classmate Cooper Stock at a recent street renaming ceremony. Photo by Daniel Fitzsimmons. Most of Cooper Stock’s friends were able to hold it together during a street renaming ceremony last week at 97th Street and West End Avenue, where the nine-year-old was killed by a reckless cab driver last January. Jacob Hume, age 10, wasn’t one of them. As Hume spoke, Cooper’s mother, Dana Lerner, broke down, choking back sobs. The two embraced after Hume finished, and cried softly together. 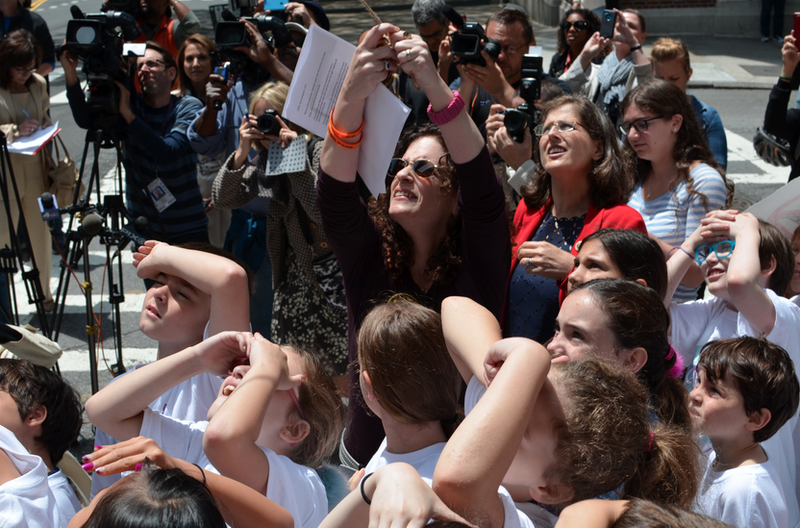 “I love what you guys said, it meant so much,” said Lerner, as she hugged the rest of his class, now in fourth grade. 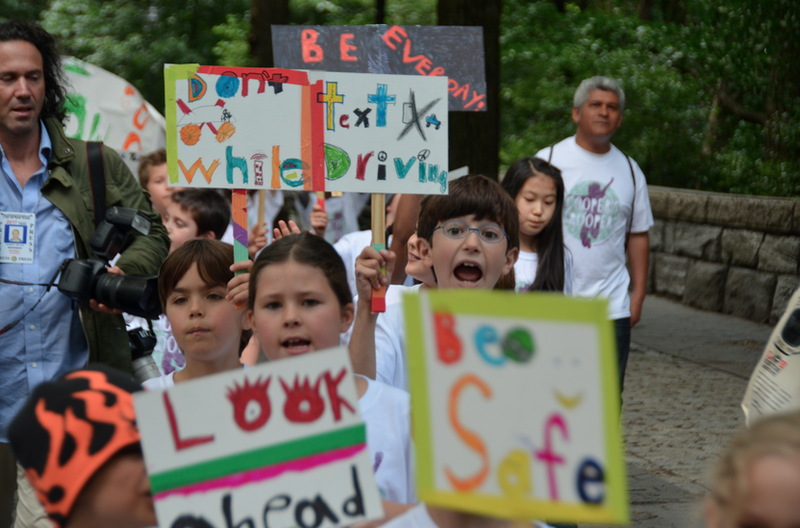 Last week, students at the Calhoun School marched from their building on 81st Street up to Cooper Stock Way to remember their classmate and draw attention to the issue of pedestrian safety. Cooper and his father, Richard Stock, were struck by cabbie Koffi Komlani as they crossed 97th Street with the green light. After Cooper’s death, Komlani was charged with a traffic violation and issued a $500 fine by Manhattan District Attorney Cyrus Vance’s office. In the months following the tragedy, Lerner devoted herself to advocating for pedestrian safety and railing against reckless driving. Her efforts led to the passage of Cooper’s Law, which revokes a cab or livery driver’s license if they are found guilty of committing a traffic violation resulting in the death or critical injury of another person. Under the law, if a driver licensed by the city’s Taxi and Limousine Commission is issued a violation or summons for an accident where someone is killed or critically injured, their TLC license is immediately suspended pending an investigation. If, during the investigation, the driver is found guilty of the violation or summons, their TLC license is permanently revoked. The bill was signed into law last June and was part of Mayor Bill de Blasio’s slate of pedestrian-friendly Vision Zero laws, which included lowering the citywide speed limit to 25 m.p.h and other measures. Calhoun School students march in memory of former classmate Cooper Stock, who was killed by a reckless cab driver last January. The students called themselves “Cooper’s Troopers” and carried homemade signs highlighting safe driving. Photo by Daniel Fitzsimmons. But despite the attention that the issue has received, and the high profile of Cooper’s death, the impact of the law named after him has been disappointing: According to the TLC, in the almost nine months since the law went into effect, only two drivers have had their licenses suspended under Cooper’s Law — and none have been permanently revoked. Lerner said she was “horrified” to learn that her son’s law had only been used twice, information that came through a Freedom of Information Law request filed by this newspaper. Helen Rosenthal, the New York city councilmember who championed Cooper’s Law, was not aware that the law had been applied so infrequently, and said that, as a result, she is considering tweaks to the legislation. An analysis of the law reveals two critical weaknesses. One is that in order for it to be triggered, the driver must be issued a summons or violation at the scene of the accident, or retroactively. Out of dozens of NYPD accident reports examined by this paper that were part of the FOIL request, only two TLC licensees were issued summonses or charged with crimes. In one case the charges were dropped. In the other case, that of livery car driver Joseph Mergile, who was arrested in January for backing over a person shoveling snow on a sidewalk in Brooklyn, Cooper’s Law was applied. His TLC license was suspended and an investigation is underway, in accordance with Cooper’s Law, said the TLC. The victim in that case was listed as critical but not likely to die, according to police reports. Another driver had his license suspended under Cooper’s Law since it was passed last September, but the details of that incident are unclear as it happened recently and fell outside of the scope of this paper’s records request. The other weakness is that Cooper’s Law is only applied to accidents where someone is killed or critically injured. In March, a California woman named Rosemarie Mifsud was pinned between two cabs in Times Square, completely dislocating her right knee and shattering her left leg. But because medical professionals at the scene deemed her injuries non-life-threatening and said she was likely to live, Cooper’s Law did not apply. Dana Lerner moves to unveil Cooper Stock Way at the corner of 97th Street and West End Avenue, where her son was killed last year by a reckless cab driver. Photo by Daniel Fitzsimmons. According to Mifsud, driver Mohamed Gendia initially claimed he didn’t see her, and then later said the accident occurred due to icy conditions at the time. Records indicate Gendia’s TLC license is current. A month and a half after hitting Mifsud, records also show he was hit with a TLC summons for using an electronic communication device while driving. Mifsud, who has been out of work since March and has at least another six months of recovery, said she has nightmares about the accident every night and said it doesn’t seem right that Gendia is back behind the wheel catching fares, especially given Cooper’s Law. Several incidents examined closely from last September to this April, where it seems Cooper’s Law should have come into play but did not, include cases like the fatal accident of famed CBS correspondent Bob Simon. According to police and news reports, livery car driver Abdul Rashad Fedahi accelerated into a Mercedes that was waiting at a red light in Chelsea, careened into a metal stanchion in the intersection, and killed Simon, who was a passenger in Fedahi’s car. The Manhattan DA’s office declined to comment on whether charges have been brought against Fedahi, but said the case remains open. News reports at the time said Simon was not wearing his seatbelt at the time of the accident. In April a delivery truck driver for the Daily News named Jonathan Long was killed in Brooklyn when his vehicle was clipped by a green cab whose driver, according to police reports, disobeyed a steady red signal. Police reports indicate driver Tazul Islam was not charged at the scene and the Brooklyn District Attorney’s Office said they do not have him listed as a defendant in their system. The TLC licenses of both Fedahi and Islam were suspended in the wake of the accidents that killed Simon and Long, but because Cooper’s Law does not appear to have come into play, could be reinstated. According to several news reports, Fedahi’s license was suspended at least six times before the crash that killed Simon. The apparent reticence on behalf of law enforcement to issue summonses or make arrests in accidents that cause critical injuries or fatalities exploits a weakness in the law, said Rosenthal. In Cooper’s case, Komlani wasn’t charged with a failure to exercise due caution violation until eight months after the crash and after considerable pressure from pedestrian advocates. Under Cooper’s Law, Lerner wonders, who is following up on whether TLC drivers are charged with traffic violations in these accidents and initiating investigations? Cooper Stock Way. Photo By Daniel Fitzsimmons. “The question is, shouldn’t Cooper’s Law mean that these drivers are no longer allowed to drive in a cab the minute they’re charged?” she said. Rosenthal requested her own data from the TLC after she was reached for comment on this story, and said that since the law went into effect, TLC licensees have been involved in 34 accidents where a person was killed or critically injured. Of those, two had their licenses suspended as a result of Cooper’s Law, while another six lost their TLC licenses as a result of other laws. Rosenthal said she doesn’t know if Cooper’s Law isn’t being applied in enough cases, but agreed that the critical injury stipulation was another weakness. “You’re piquing my interest in thinking about a tweak to the law, but Cooper’s Law only takes into account critical injury or death,” said Rosenthal, who noted her office would be looking into reexamining portions of the law given recent findings. While Lerner doesn’t fault Rosenthal for the way the law is written, she said revelations about its use are evidence of systemic dysfunction in enforcement. But the limitations of Cooper’s Law had no effect on his friends and supporters, who marched last week with homemade signs and fond memories to the street corner now bearing his name. 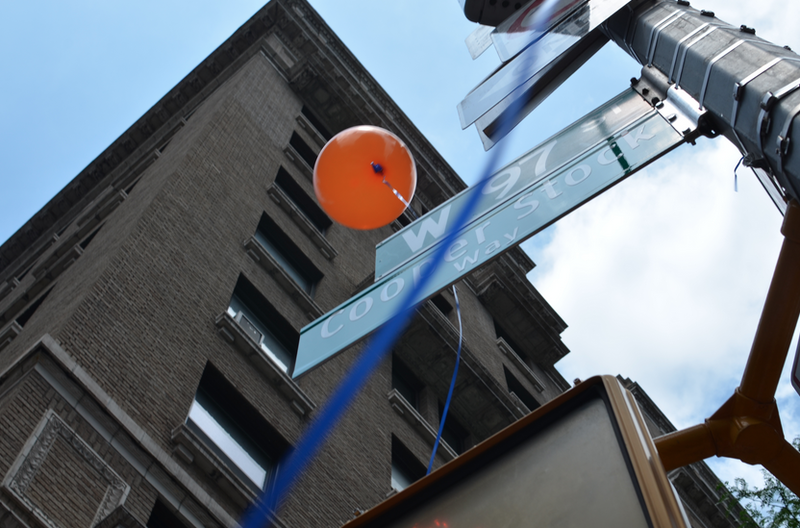 “Goodbye, my friend,” said one classmate, as 10 blue and orange balloons floated on the air above West End Avenue, one for every year of Cooper’s life, if he were still alive.